You can add Warm-up Questions, Formative Assessments, and Interactive Activities to any lesson using the Pear Deck for Google Slides Add-on. 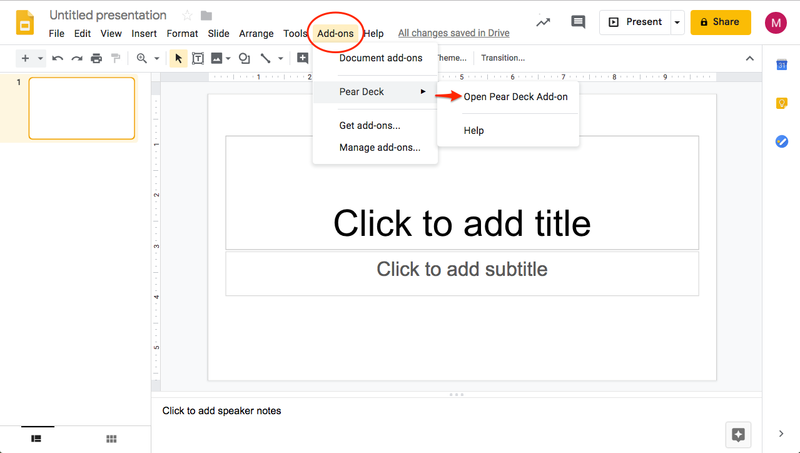 Open a new or existing Google Slides file and the Pear Deck Sidebar. With the Sidebar open, you can add a pre-made activity template for the Beginning, During, or End of Lesson. Let's start with a template for the beginning of the lesson. Notice Peary at the bottom of the slide. The speech bubble lets you know this is a Text Response slide, so students will be able to respond by typing text. When you click Present Lesson, you'll start a new Session and generate a unique join code so students can join your Session. When you reach this slide, students will be able to type an answer to this question. Right from the beginning of class, every student is actively thinking about the lesson and sharing their thoughts. You can also add your own content and turn it into an interactive slide! Just scroll down to the Ask Students a Question section. This is a Drawing Response slide, so you can see Peary with canvas at the bottom of the slide. Students will be able to draw and annotate on this entire slide during the Session. After you've created all the content you need for your lesson, add a temperature check or formative assessment slide to end the class. Finally, click the green Present Lesson button in the Pear Deck sidebar to start your Session. 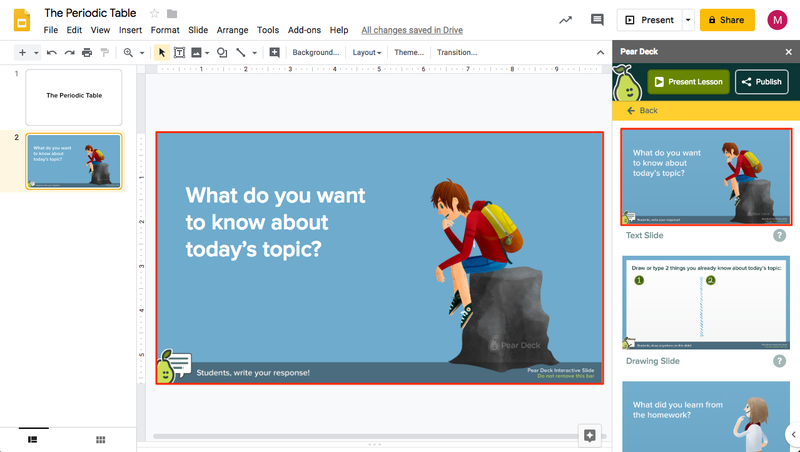 If you present through Google Slides, your students will not be able to join a Session and interact with the amazing slides you just created! That's it! That's how easy it is to create your interactive formative assessments and activities. Now every student can actively participate in your lesson leading to deeper, longer-lasting learning.